1.) Summer school will give your teen more time to learn the basics of the subject being taught. Middle and high school classes mimic the fast paced world in which we live. Unfortunately, teens learning math and science often can’t keep up and get lost. Considering each step is a building block for the next concept in the course, it isn’t a mystery why many teens do not pass a class the first time around. The time that these teens need is offered during summer school sessions. 2.) The environment of a summer school class offers your teen a different approach. It tends to be more relaxed with smaller classes – it’s the optimal learning environment in which all teens could benefit. Couple that with having a different teacher who uses their unique teaching approach and your teen may do very well with the subject that he/she previously failed. Teens, such as these, do well in summer school and often become more positive about their academics. 3.) Summer school will give your teen a second chance to obtain class credit, preventing doubling up a core class during the school year. Here is how today’s high school works: Each state requires a certain amount of core classes to be taken by every student and passed before they can graduate. So, even if your teen isn’t going to college, he/she may still have to pass four math classes including algebra and geometry to obtain his/her diploma. This can be demoralizing to a teen that has a hard time in math classes. If he/she fails the one, having to take two of these together the next year can lead to more failure with the possibility of the teenager dropping out of school. Summer school prevents this problem. 4.) During summer school, your teen will be able to focus on just that particular class. Remember, your teen is facing the same type of stress that we are facing in our adult lives with deadlines and the push to perform well. 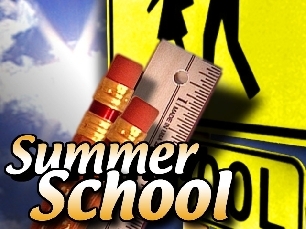 Summer school will help those teens who get overloaded by having too many classes to focus on at one time. So, if the work load during the school year was a problem for your teen, summer school is the option to take to get the class credit. 5.) Summer school will give your teen the chance to raise his/her grade point average. A failure in any class really hurts a teen’s cumulative average and can cost him/her the chance to go on to the college or technical school of his/her choice. While letting an elective class go and not retaking it is an option, summer school grades replace the failing grade already earned, thereby raising your teen’s grade point average. You can help take away the stigma of going to summer school by talking to your teen and letting him/her know that not passing a math/science/whatever class does not define who he/she is. That your teen’s grades do not make or break how much you love him/her. Create a positive conversation by bringing up something your does well. Then discuss ways to keep a failing grade from happening again by using study groups and perhaps hiring a tutor at the first sign of trouble in a class. When it is all said and done, summer school will get your teen back on the right track with passing grades and you can use the experience to strengthen the parent-child bond. A definite win-win situation.